Well, what can i say about Paal Payasam. It is a classic dessert for special occasions, celebrations and festivals. Today being International Women’s day, i thought why not give a special treat to celebrate Women’s day. Paal payasam is a traditional Kerala dessert prepared during festivals, especially ‘a must to have’ dessert during Onam / Onasadya. The traditional Paal payasam is slow cooked with a special type of Kerala rice called, Unakalari (also known as Kerala red rice, Rosematta rice, Palakkadan matta ari). But you can use any other non-sticky white raw rice or Basmati rice for making it. Now a days due to time constraints, paal payasam is prepared in a pressure cooker. Traditionally made paal payasam will have a pink hue to it as the rice is slowly cooked in milk.The paal payasam served as Prashadam to the devotees who come to worship The Guruvayur Shri Krishna Temple in Kerala tastes divine!! And i could go on and on. 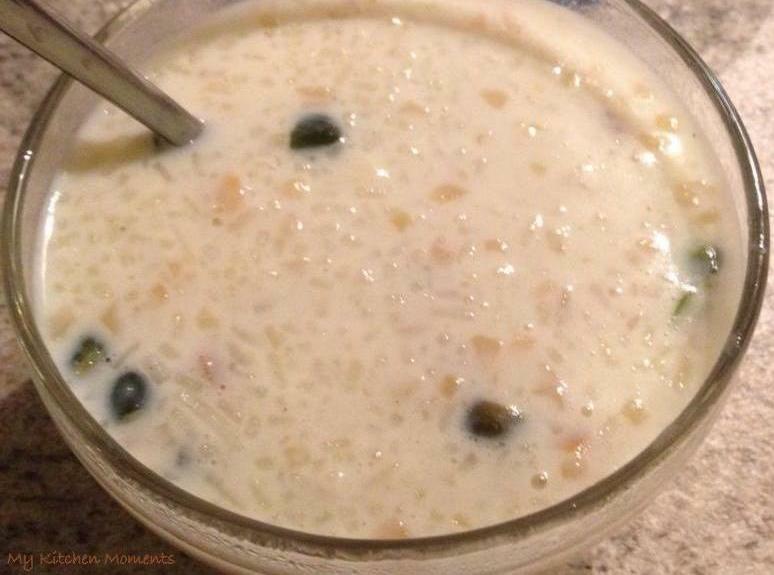 So below is the Paal Payasam recipe. Happy Womes’s Day!! In a heavy bottomed pan, add milk and allow it to boil in a medium flame. Once the milk boils, add sugar and simmer it until the milk reduces to half. Now add the washed rice and cook on a low flame, stirring frequently until the rice is cooked soft and the milk thickens. Remove from flame. Add cardamom powder. Garnish with fried cashews and raisins and serve warm. Traditionally cardamom powder, cashews and raisins are not added to the paal payasam. This dessert is to be eaten or enjoyed without any fragrances, spices or nuts, because it will distract the original flavor which is pure milk. But here, you can see that i have added cashews and raisins and gave it a twist. It tasted delicious!! For quick pressure cooker method, you can add all ingredients to a pressure cooker and cook for 3 whistles. When the pressure leaves, open the lid and add 2 tbsps of condensed milk, adjust the consistency by adding boiled milk, mix well and serve. Adjust sugar as per your taste as the condensed milk will make it too sweet along with sugar. You can serve the paal payasam chilled as well. You have a lovely blog too! !